'From Ore to Orchids' - a thought-provoking film about man, industry and nature. England 2010 - "From Ore to Orchids"
Many of us can picture the Peak District landscape as it is today – a diverse landscape of outstanding natural beauty scattered with picturesque villages and quiet hamlets – but what do we really know of its hidden side? Since mediaeval times, mankind has left an indelible mark on the landscape, shaping it, working it, tending it – and continues to do so today. "From Ore to Orchids" explores some of the unlikely and sometimes uncomfortable inter-relationships between man, industry and nature. A film designed to raise more questions than it answers, "From Ore to Orchids" highlights the unexpected and almost symbiotic relationships that have developed over time, through history, and into the future that we all have the opportunity to influence. "I was inspired to look at the orchids of some of our ‘post industrial’ lead landscapes by the excellent ‘From Ore to Orchids’... ...this very high quality DVD tells the story of the geology, history and natural history of ‘the lead legacy’." Shot in HD, "From Ore to Orchids" is a poignant, factual work, interweaving beautiful photography with harsh reality. Below are a the first few minutes of the film. If you represent a local (nominally Derbyshire) not-for-profit organisation, such as a local history group, U3A group, etc, and would like to see the full film, please feel free to contact us. Running time approx. 45 minutes. 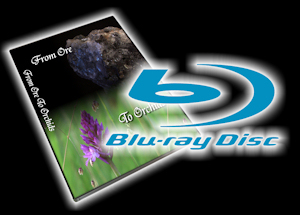 "From Ore to Orchids" is available on standard definition DVD as PAL 19:6 (widesceen) format. If you've got High Definition TV, "From Ore to Orchids" is available on Blu-ray Disc (1080i format) - a truly stunning way to view. There are currently no public showings of From Ore To Orchids booked. If you would like us to show the film to your group or organisation, please contact us. Alternatively, you may also purchase a copy of the film through this website, but again, please contact us if you wish to show it publicly.